Agricultural chains – their name alone is a direct reference to their main field of use: agricultural machines. 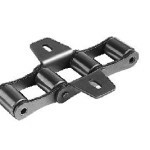 The pitch differs greatly from that of roller chains (e.g. p = 38.4 mm or p = 41.4 mm) in some case and they can be equipped with a variety of attachments and fasteners.